This was my first trip to Uruguay so I did my homework ahead of time. I wanted to know as much as I could about the country and its history. Most of my research was done on-line using Wikipedia.org as my source. Here is what I discovered. Uruguay is a country located in South America, the climate is temperate and the population is mainly of European descent, primarily Spanish and Italian. It is bordered by Brazil to the north, by Argentina across the bank of both the Uruguay River to the west and the southwest, and the South Atlantic Ocean to the southeast. Uruguay or as it is officially known Oriental Republic of Uruguay or Republic East of the Uruguay River is home to 3.3 million people of which 1.5 million live in or around Montevideo. The population is highly educated and while relatively poor by US standards, has a middle income economy, dominated by exports of agricultural and industrial products. Our outfitter for this trip was Los Gauchos, owned by club member George Criddle. His operation in Uruguay was located on the El Sauce estancia about 100 miles from the Brazilian border. El Sauce is working ranch of some 4000 hectares, about 10,000 acres. The ranch is highly self-reliant. Their primary products are registered Hereford cattle, sheep for meat and wool, rice, and ducks. Groves of eucalyptus scattered around the ranch are used for fence posts, building materials, and duck blinds. The guides cut the long thin branches and build blinds for the ranches guests. The ranch has about 14 different locations that are used for hunting. The guides take the fresh cut branches out to these locations on the day of or the day before a hunt and that way the ducks don't get wary over the course of a season. George has done a good job of networking within his alma mater LSU and we had five LSU students as our guides. These kids live and breathe duck hunting and George has paired them with one of the ranch hands that knew the ranch and how to hunt the ducks of this area. It really helps to have quides that speak English and Spanish on one of these trips. My Spanish is very limited and while English spoken by most of the staff it really made things go a lot more smoothly. The day was just getting ready to get started when the first flight of teal came cruising in. I have learned from previous South American duck hunts that it is nearly impossible to shoot ducks in the dark. We could hear the birds but it was still to dark to see them. My companions for this trip were club members Joe Ring and James Parkey. This morning we were hunting at the edge of a large dry rice field on the back of the El Sauce estancia. Our guides, Jimmy and Josh, were busy setting out the decoys in a small corner of the field that was holding water. "Birds low on the left",, whispered Jimmy. "Ducks coming in from behind on right"... echoed Josh. For about an hour we had non-stop shooting, ducks came from all directions, and by the end of the shooting the little patch of water was covered with the results of our efforts. This morning we shot mostly Brazilian and speckled teal. Lots and lots of teal! "At one point in this frenzy of activity, I dropped six ducks with two shots. I mention this only because I have witnesses!" The evening hunt was a lake almost directly across from the ranch house. At home we would call this a stock tank but in Uruguay it's a lake. The pasture around the lake was well grazed and the cattle found us very amusing as we set up in our Goulie covers... The lake had high banks on three side and we positioned on the northern end. At first the hunting was mostly ones and twos but around 3:00 it started to heat up. The teal came in groups of 5 or 6, then 8 to 10, and then it really got good. Our yellow lab, George, was ready for dinner and a nap by the time we finished. On day two we traveled to the hunting area the farthest from the lodge, we went about thirty minutes away and through about 10 gates. This morning our guides were John and Joe. The lead guide Santiago had prepared this blind the day before, we drove down the road and stopped midway down. The blind was on the edge of the road. This morning we were hunting an irrigation canal used to flood the rice fields. The activity started again before the sun started up. The blind afforded us an opportunity to see 360 degrees around us. We watched each others shots and ataboys were given all around. Today's activity wasn't as plentiful as the day before but still better than any place else! The guides decided to split us up for the evening hunt. Each shooter would get a guide and a retriever. The areas we went to hunt weren't large bodies of water but small pools left over from the rains a week before. The first spot we pulled up to didn't look like much. Jim and Joe both passed so I drew the short straw. My guide was Johnny, a pre-med student at LSU. We had Fred the chocolate lab as our partner. The pool was only large enough for us to place about seven decoys and my first impression was it was going to be a slow afternoon. Always beware of first impressions, by the end of the evening shoot I had downed 48 ducks. What a honey hole. Teal came in at a constant pace. The beautiful weather we had been having quickly turned into loud thunder and heavy rain over night. The rain covered the rice fields and the hunting was just that...hunting. We didn't have the volume of opportunities that we had on the hunts before. The rain scattered the birds and by mid morning the sun came out and it heated up. Uruguay weather reminds me of Texas, "If you don't like it, just wait 24 hours and see what happens". James had to leave early so he packed and left after the mornings hunt. After a hearty lunch and a short nap Joe and I were taken to another small lake on the front of the ranch. Jimmy had spotted a group of whistling tree ducks there earlier and we wanted to try for them. Santiago made Jimmy a call out of the brass of two spent shotgun shells. It produced a real shrill whistle. It wasn't long after we got in position that the first flight of teal came in. "Stay low," whispered Jimmy. He started to use his new call and the big birds turned and started in. 'Wait until they lock-up,' he cautioned. We were able to drop three drakes out of the group. The mild thunderstorms of the night before were nothing in comparison to the rain and thunder we had the last night. Joe and I had planned to sleep in this morning and the weather made us happy we had made the right choice. When it was finally light enough to see the beautiful flat rice fields were now lakes. This was going to scatter the ducks and make hunting difficult. Joe and I packed in semi darkness and ate by candlelight that morning. The drive back to Montevideo was interesting because of all the rain and high water. Our accommodations were first rate. The ranch house was built in 1927 by the grandfather and housed the family until the current generation moved to Montevideo. The guest rooms were the children's rooms and each had its' own bath, wardrobe, and large cozy beds. At the end of the days hunting activity we would lounge in front of a large fireplace and share appetizers, drinks, and many stories. All of our meals were served in a formal dining area. Our attendant at each meal was Carlos. Carlos' English was limited and James Parkey helped us understand what we were having. Georges' chef, for this lodge, Gustavo prepared 3 meals per day for us. Breakfast was usually eggs fixed to your liking, bacon, fruit, and cereal with yogurt, toast, and very strong coffee. Lunch was always something a little heavier than I was used to, but with a gourmet fare. Beef is not as prevalent as it was in Argentina instead we had lamb and Rhea (ostrich). If I was asked to rate this trip, I would have give it an A. Meals were excellent, accommodations unique, hunting excellent, and guides first rate. This trip we shot mostly Brazilian teal, silver teal, white cheeked tree ducks, and speckled teal. As a group we are all ready for next year! 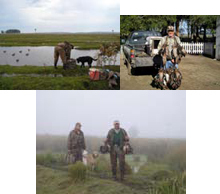 (Editors Not: Los Gauchos has moved their operation to the NW part of Uruguay and now offer High volume dove, decoyed pigeons, ducks and Dorado fishing. Dallas Gun Club member waits for the next flock of ducks to fly over in Uruguay. Just an average morning duck hunting in Uruugay with Los Gauchos Outfitters. 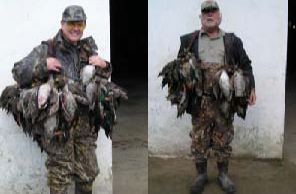 Duck hunting season in Uruguay with the Dallas Gun Club memboers and professional shooting instructor, Richard Whaley.